The rise of Pink Gin is a confusing one, given that, well, there are various definitions of this romantically coloured drink. 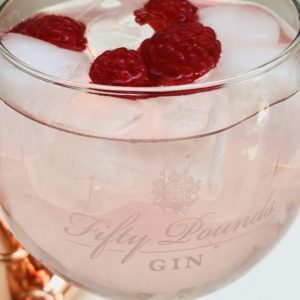 Traditionally, Pink Gin was a cocktail, made fashionable in the United Kingdom around the middle of the 19th century, made of gin – usually Plymouth Gin – combined with Angostura Bitters the deep red shade of the latter leaving the contents of the glass the fetching titular shade. Add a dash of Angostura Bitters to a mixing glass, fill with ice and stir. 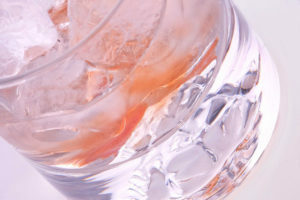 Roll the mix of Bitters and melted water around the glass and strain off, to leave a light “wash” on the inside of the glass. Pour your large measure of Fifty Pounds over the ice, adding more ice if necessary. Stir and strain into a cocktail glass, with a twist of lemon. Trim and wash your rhubarb, removing the leaves. Cut the stalks into pieces of around 3-4cm in – length, place in a large jar – around a two-litre capacity will be required – cover with the sugar, seal with the lid and shake so that everything is combined. Over the course of a day or so, the sugar will draw the juice from the rhubarb. After 24 hours have passed, add your gin. Store it in a dark place or at the back of a cupboard, and leave for around for weeks. Strain the liquid into another bottle and seal. Discard the now rather pale bits of rhubarb and use your new pink, rhubarb-flavoured gin as the basis for very refreshing gin and tonics. 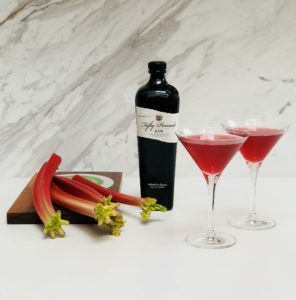 ANOTHER alternative pink gin – and far quicker than the rhubarb version – is a quick Prosecco cocktail, made with either strawberries or raspberries for that celebrated shade. A handful of red berries. Take a large glass and add the berries. Muddle them – i.e., mash them with a wooden spoon into a thick liquid. Fill with ice, add the gin, tonic and stir. Once combined, add the Prosecco and stir gently to combine. Garnish with more berries if required. If muddling is a little too complex, a more straightforward approach is to use cranberry juice. Fill a jug / large glass with ice. Add the gin, cranberry and wine and stir. Add sliced lemons and tonic to taste. Pour into a chilled glass and serve immediately. Gin, charcoal and some unusual marinades ….